Restore, protect and shine your tires safely and easily! 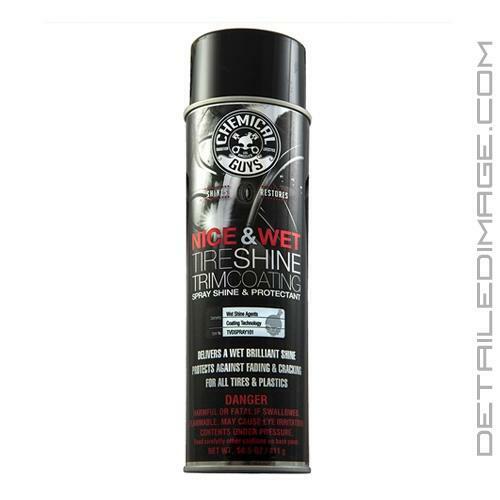 The Chemical Guys Nice & Wet Tire Shine Trim Coating will restore, protect and shine your tires all in one easy to use high quality spray formula! Harsh UV rays and intense heat make rubber and plastic parts fade, look chalky, and even crack. After time this makes your tires look pretty ugly and it just takes away from the overall look of your vehicle. Grab a can of Nice & Wet and spray a light mist directly onto your tires. This aerosol can produces a thick foam that is easy to maneuver and it will stick to the side of your tires, instead of running onto your rim or the ground. Let this formula soak into the rubber for a few seconds and wipe away any excess with a clean microfiber towel. Moisturizing oils and what Chemical Guys calls "wet shine agents" will help restore them and bring back that deep and dark look back! This formula not only works on your tires, but your grill, bumper, rubber window trim, plastic trim, vents, engine bay, and much more. The weatherproof formula protects against those harmful UV rays and it will not sling or run. This helps the formula last weeks, even in the rain! One coat is recommended for a matte finish and multiple coats will produce an extremely glossy shine that makes your tires look like they are dripping wet! Chemical Guys Nice and Wet Tire Shine creates a high gloss shine on all tires. The long-lasting tire shine spray foam gives a super wet finish in seconds. Nice and Wet restores a deep, dark shine that lasts for weeks. Easily sprays on low-profile and full size tires for maximum versatility. Works great on fender liners and plastic bumpers. Nice and Wet Tire Shine delivers the ultimate high gloss shine on all tires. Clean surface before use. Spray on and buff or let dry for nice and wet shine. I will not buy this item again. The way it sprays onto trim or tires is unacceptable. Maybe it is the actual sprayer that needs to be fixed by Chemical Guys but it was a huge mess and covers a straight line so to spray a wheel well it takes a lot of product. I will go back to buying their Black on Black spray as it is much better, and is cheaper.